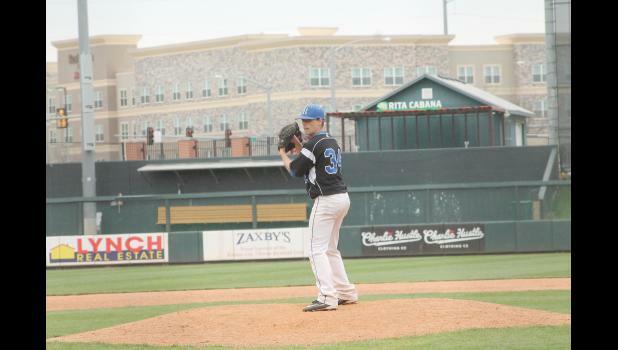 Holton went 1-3 at the Butch Foster Memorial tourney hosted by Bonner Springs last weekend at the T-Bones stadfium. In the 15-2 loss to Bonner Springs, Holton scored its two runs in the top of the third inning on a walk by Aaron Bain and singles by Jackson Martin, Eli Prine, Brady Forrester and Parker Zeller. Cody Mulroy was the starting pitcher in this five-inning game. In the 6-1 loss to Basehor-Linwood, Zane Moylan was the starting pitcher for Holton four innings. Moylan struck out three batters, walked three and gave up six hits and six runs. Holton got its lone run in the top of the third inning after Cody Mulroy singled, reached third base on passed ball and scored on a groundout to second base by Brady Mulroy. In the eight-inning, 5-3 win over Big Seven League foe Perry-Lecompton, Brady Forrester was the starting pitcher for Holton. Forrester struck out eight batters, walked three and allowed three earned runs on three hits in five innings pitched. Coach Purcell said it was probably Forrester’s best outing of the season, so far. Eli Prine pitched for Holton in relief, striking out one batter, walking none, allowing two hits and no runs. The Kaws had defeated the Wildcats two times earlier this season in league games. Holton trailed the Kaws 3-0 until the fourth inning when the Wildcats cut the lead to 3-2. Holton then tied the score 3-3 in the fifth inning. In the eighth inning, Kyler Tannahill led off and reached base on an error. The next batter, Dylan Aeschlemin, grounded out to third, but advanced Tannahiill to second. The next batter, Prine, singled and C. Mulroy singled after that to load the bases. B. Mulroy, the next batter, hit the ball to the third baseman, who fielded the ball and threw out Tannahill at home plate. Forrester, the next batter, then singled to center field to score two runs. More details about the games are available at the subscriber pages of The Recorder. Thanks!